Does That Include Your Community? Find out Here! Are you looking for a premier roofing contractor in Cuyahoga, Lorain, Medina, Erie, Ottawa, Summit, Sandusky or Lake Counties who can repair or replace your roof? If so, then you've come to the right place! 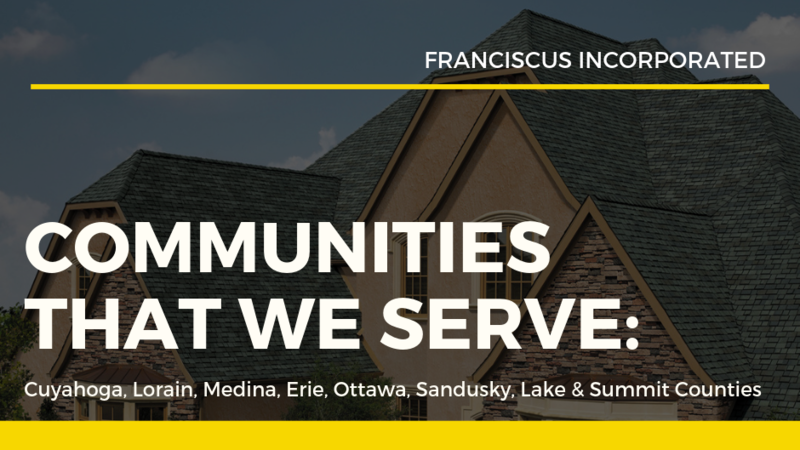 Franciscus Incorporated has been proudly serving the Greater Cleveland area since 1991, and with well over 18,000 satisfied customers and counting, you can be sure that we'll get the job done right! Additionally, as the largest residential roofing contractor in the state of Ohio, we go above and beyond to offer the best value in home exterior renovations. We make it our mission to use the best labor force combined with the best product available, and our Northern Ohio Roofing customers love it! We offer our Northern Ohio customers a wide variety of products and services which include but are not limited to; new roofing, re-roofs, tear-offs, new construction, insulation, windows, siding, gutters, leaf protection, roof repairs, ventilation, storm/hail insurance consultation, and ice dam removal and consultation. If you would like to learn more about our products or services or to get started today, give us a call at 1-866-STAY-DRY! Bonita Springs, Marco Island, Naples, North Naples, Golden Gate, Fort Myers, Cape Coral, Estero and Lehigh Acres.